Here is my latest interview via GreenBiz: 10 Minutes with Ryan Bennett. It’s amazing how sustainability is getting integrated in so many places–now in chickens! I love it. Ryan has a smart vision and I think he can lead the way. This entry was posted in Uncategorized on March 18, 2019 by Bob Langert. In back to back days, two fantastic videotaped events were released. First, a very unique and special event. How many authors get interviewed by their nephew? In this case, David, the son of my older brother, Andy, whom I idolized as a role model growing up, interviewed me. David prepared like no other, and he was ready, as I you will see in the interview. Second, my presentation and Q&A to the Fernandina Beach, Fl. Rotary Club at Story and Song Book and Bistro was released on C-Span2 on the BookTV channel. I think I need to tamp down the use of my hands and arms in the way I talk, but I thought C-Span captured the event really nicely. This entry was posted in Uncategorized on March 17, 2019 by Bob Langert. What a variation of podcast interviews! March 11, 2019: It’s been a whirlwind for me since my book was published just about two months ago. I’ve been asked to be a part of several podcasts. All of them were fascinating for different reasons Here’s a recap and links for those who are interested in more. “When you think about picking a career that’ll help make the world a better place, do you think of working at the largest fast food company in the world? You may not, but that’s indeed what Bob Langert spent his career doing. 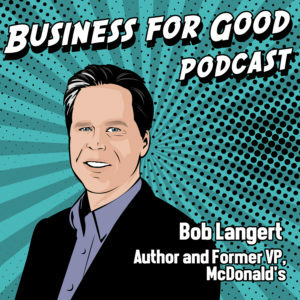 The former McDonald’s executive was at the forefront of many of the decisions the restaurant behemoth made relating to social responsibility, from retiring styrofoam containers to paying tomato pickers more to improving farm animal welfare. Now retired, Bob has a new book out about his career spent trying to help the fast food chain do better. It’s a candid look at where he thinks his former employer got it right and where he believes they came up short. The podcast created this “superhero” drawing, as they do with all their guests. Cool! Katy was a delight, about as energetic as they come! She asked me some zingers toward the end, on food service wages. Give it a listen to see if you think my answer resonates–or not. I loved this interview for two reasons. Michael asked me about current events, like whether meat should be defined as derived from animals, and a piece of art showing Ronald McDonald’s on a crucifix. What did I think of that? Plus, this show emanates from the southside of Chicago, near where I grew up. I am proud of my southside Chicago heritage! This entry was posted in Uncategorized on March 11, 2019 by Bob Langert.